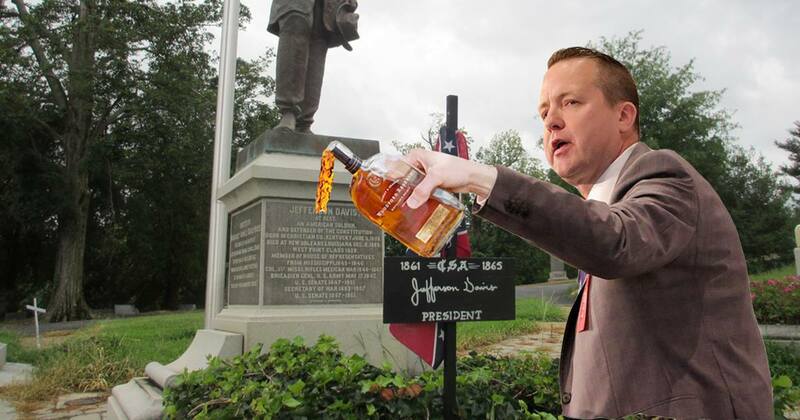 RICHMOND, Va. — Responding to a noise complaint at approximately 8 a.m. Saturday, Richmond police discovered former gubernatorial candidate Corey Stewart sobbing while pouring out a bottle of bourbon over Jefferson Davis’s grave in Hollywood Cemetery. Subscribe to our Patreon for some exclusive benefits. Police had been alerted to the disturbance after 911 calls from nearby Oregon Hill residents reported a ghostly, weak moaning carried on the morning wind out of the cemetery. Officers responding to the call quickly traced the wails to a bereft Stewart, who was emptying the contents of a bottle of Virginia Gentleman out over the memorial to the Confederate president. Officers removed Stewart from the cemetery but did not press charges for trespassing. Stewart was later seen weeping in front of the Robert E. Lee monument on Monument Avenue in the morning hours. There’s probably a holiday of some sort coming up, so visit our online store for some cool swag.